When I first learned of the H'el On Earth storyline, I was extremely excited. Not only was it going to be the first "Super-Crossover" of the New 52, but a new, lengthy adventure for the Man of Steel. Growing up with the Superman comics from the '90s, I love to find myself sitting down and becoming invested in a giant Superman epic. I was primed for Superman: H'el On Earth to accomplish this. Much to my satisfaction, it did. In H'el On Earth, we find Superman contending with Superboy and Supergirl as a mysterious new Krypotian, the titular H'el, appears on the scene. H'el has discovered a way to resurrect Krypton through the use of a time travel contraption; the only problem is it will destroy Earth in the process. Supergirl, restless since coming to Earth, devotes herself to H'el (though she's unaware of his plans for Earth). The story provides a ticking clock as Superman tries to thwart H'el while connecting with Superboy and reasoning with his cousin. H'el On Earth has a lot going for it. It delves into the backstory of Krypton which is always interesting, especially for a Superman who really doesn't know that much about it. It also gives us the first real interaction between Superman, Supergirl, and Superboy in the New 52. Previously, each has had some minor contact with one another, but nothing on the scale such as this. Because this version of the DC Universe is new, we get to see the building of these relationships. Supergirl is mad at her situation and lashes out towards Superman at how content he is on Earth. It makes sense how easily swayed she becomes with H'el. She's lost all she's even known and now this mysterious guy says he can bring it all back. As a brash teenager, why wouldn't she accept his offer? Writers Scott Lobdell, Tom DeFalco, and Mike Johnson craft an aura of mystery around H'el. Is he truly from Krypton with ties to Jor-El? Or does he just think that's the case? We are never quite sure, and perhaps H'el isn't either. Unfortunately, this story doesn't go into what's the truth and what isn't (which would have helped flesh out his character greatly). However, what does work is H'el's characterization. He's surely a madman, but you get why he's doing what he's doing. A sympathetic villain is usually the best kind of villain. He wants his planet and people back. And the logic behind his plan actually makes sense: if he goes back in time and stops Krypton's destruction, H'el will create a new timeline where he won't need to destroy Earth to begin with. But H'el cannot be 100% certain that his plan will work, a problem the story probably doesn't explore as much as it should have. The only major problem I had with H'el (besides the non-reveal of his backstory) was the inconsistency of the backwards S-shield on his chest. In some chapters it's there, other times it isn't. Some characters notice it, but others don't. That it's never fully considered makes me wonder what the point of it was. H'el On Earth spreads across the Superman, Supergirl, and Superboy titles, and there are times that it feels a bit padded. The story starts out well, but just before the mid-point it starts to spin its wheels. It felt like there were too many chapters where H'el was continuously "almost done" with completing his time machine. I suppose this was meant to show that some of these chapters are happening simultaneously, but in a massive collection like this, things get bogged down. We get some interesting character interactions (particularly between Superman and Superboy), but little story progression occurs. Not helping matters are the few tangents this tale takes us on including a visit to an imprisoned Lex Luthor and a trip inside a pocket dimension. Some of this could have been cut down. Still for me, Superman: H'el On Earth largely hits all the right notes. The story is exciting and kept my interest throughout. It does suffer from some pacing issues, but this is unfortunately common in the artificial structure of crossovers. And while the story does resolve itself a bit too quickly, it does give readers a story about the "Super-Family" at odds with one another and then overcoming those odds for the greater good. What more can anyone ask for in a Superman story? What more can anyone ask for in a Superman story? Scott Lobdell gone and Geoff Johns named as his replacement. And that wish has been granted! There's some very strong material in this crossover, especially the Supergirl/H'el relationship, but I think it ran for way too long, and that whole Superboy annual was a quite unnecessary detour. The ending is also somewhat disappointing, since the whole thing turns out to be just the setup for another crossover, "Krypton Returns", which I'm sure will get its own collection like this one. Geoff Johns & John Romita Jr. are supposed to be doing Superman soon. I'm hoping they are taking over the main book & giving Lobdell the boot, instead of making it a mini series, or a "monthy" like Superman Unchained. 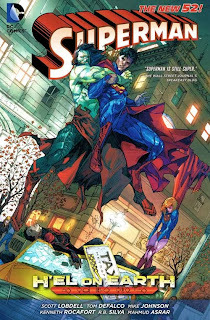 In a recent Newsarama interview, Lobdell said Superman #31 will be his last issue, and Johns and Romita will take over the book with #32.